This page covers advantages and disadvantages of MESFET. It mentions MESFET advantages or benefits and MESFET disadvantages or drawbacks. MESFET is the short form of Metal Semiconductor Field Effect Transistor. It is one type of FET which is derived from metal semiconductor schottky barrier diode. GaAs MESFET is used instead of silicon devices as GaAs delivers high electron mobility, high electric field and high electron saturation drift velocity. GaAs MESFET is widely used as microwave integrated circuit in broadband amplifier. 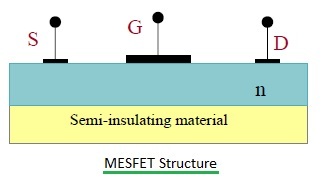 The figure-1 depicts typical MESFET structure. The working operation of MESFET is similar to JFET but MESFET has only one depletion region instead of two used in JFET. The source-gate junction is kept in reverse bias while source-drain is kept in forward bias. Refer MESFET vs JFET vs MOSFET >>. ➨They offer much better noise figures at microwave frequencies. ➨They deliver high power output. ➨GaAs MESFETs offer high electron mobility, high electric field and high electron saturation drift velocity compare to silicon MESFETs. ➨It offers high transit frequency. ➨MESFET structure consists of schottky metal gate. This limits forward bias voltage on gate to turn-ON voltage of the schottky diode which is 0.7V typically. ➨Due to above reason, threshold voltage must be less than the turn-on voltage. Hence it is very difficult to fabricate circuits which use large number of enhancement mode MESFETs.